Welcome to Logan A/C & Heat Services, Inc.! 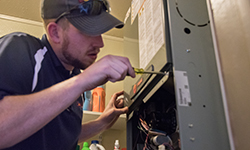 We proudly serve the Dayton, Columbus, and Cincinnati areas, providing residential heating and cooling repair, replacement and routine maintenance services. If you are in need of a new furnace or air conditioner in the Dayton, Columbus, or Cincinnati areas, give the fast, friendly team at Logan Services a call! We can offer FREE, same-day estimates and next-day installation for your new heating and cooling system.